The Tigers' Angel Nunez singles to left on the game's first pitch to start things off. JP Hollywood follows with a single to put 2 on for Justin Kaid. He grounds into the 6-4-3 double play; but gets the RBI as Nunez scores on the play. Drew Vassil draws a 2 out walk to send up Carlos Nunez with 2 out and a man on. He drils a 2-run homer to left center field. The Tigers get 3 runs in the opening inning to take the early 3-0 lead. The Blue Jays get 2 runners on base in a hurry to start the bottom of the 1st. Anthony Evangelista walks and Garrett Behnke is hit by a pitch. Evangelista advances to 3rd on a pass ball and then scores on a sacrifice ground out by Danny Casey. The Blue Jays end up with 1 run in the inning; trailing 3-1 through the first inning of play. 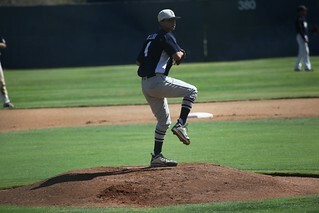 The score was still 3-1 as we entered the bottom of the 2nd inning. The Blue Jays get a 1-out single from Chad Gordon. He advances to second on a balk call on the pitcher. Two batters later, Kevin Serr hits an RBI single to left. The Jays settle for the lone run in the inning; cutting the deficit to one run ... 3-2 Tigers through 2 complete. We move to the top of the 4th inning where the CBA Tigers maintain a narrow 3-2 lead. They lead things off with Jose de la Rosa; who wastes no time as he belts a solo shot to left center field. The Tigers get 1 run in the inning to add to their slim lead; now up 4-2. But the Blue Jays get a break in the bottom of the 4th. Erick Melara reaches base on a catcher's interference call. Chad Gordon is hit by a pitch. Corey Richards reaches base on a fielders choice. A wild pitch scores Melara from 3rd. Kevin Serr singles for his 2nd RBI of the game. Soon after, leadoff hitter Anthony Evangelista hits a 2-out solo homer to left center. The Blue Jays get 3 runs in the inning; now the CBA Tigers 5-4 through 4 innings of play. The Tigers come to bat in the top of the 6th inning; still trailing by a run - down 5-4. With 1 out in the inning and nobody on, Jose de la Rosa comes to bat; having homered to left center in the 4th inning. He does it again ... drilling a solo shot to pretty much the same spot as last time - to left center field. The CBA Tigers get the 1 run in the inning to deadlock this game at 5. We were still tied 5-5 as we entered the top-half of the 8th inning. Niko Garcia pinch hits for JC Barker. He rips one down the right field line for a leadoff double. Garcia soon steals 3rd and then scores the go-ahead run on a ground out by Tony Cabrera; who gets the RBI. This would prove to be the critical RBI; as neither team would score in the 9th and final inning. The CBA Tigers escape with the narrow 6-5 victory in game 1 of this best of 3 series. With the Blue Jays failing to score in the top half of the 1st inning; the CBA Tigers would have a chance to draw first blood in this critical game 2; and perhaps win this one going away and just take the afternoon off all together. Leadoff hitter Angel Nunez is hit by a pitch to put him on base for JP Hollywood. He singles to center ; putting runners at the corners for Justin Kaid who hits a sacrifice fly to left; scoring Nunez from 3rd. The Tigers settle for 1 run in the inning to take the early 1-0 lead. Garrett Behnke led things off for the Blue Jays with his 3rd hit of the game; a single. Danny Casey follows with a double in the gap; sending Eddie Baeza to bat with 2 on and nobody out. He drills a 3-run homer to left center. That would end the day for Tigers pitcher Eddie Urquiza; sending in Victor Reyes to relieve him. Scott Strickland singles to right to keep the drive alive for the Blue Jays. 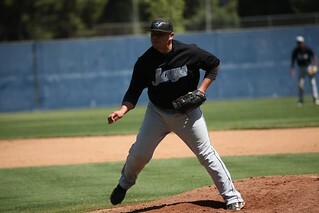 Erick Melara draws a walk. Chad Gordon drills a hard line drive that is snagged by Tiger shortstop Jose de la Rosa who lays out to make an amazing diving catch. He's followed by Dominick Hanna who who singles home Strickland. The Blue Jays get 4 runs in the inning and now lead by a score of 5-1 through 4 1/2 innings of play. The CBA Tigers lead off the bottom of the 5th inning with Johnny Alcarez who singles to left. The next 2 batters would be retired; sending up Jaime Dorado who hits an RBI single to right center. The next batter is leadoff hitter Angel Nunez who drills a line shot down the left field line for a double. But the Tigers had to settle for the lone run in the inning; down 5-2 through 5 complete innings of play. The Blue Jays come to bat in the top of the 8th inning; still holding the 5-2 advantage. Corey Richards reaches base due to a fielding error. Anthony Evangelista singles to left. Garrett Behnke follows with an RBI single to right. Behnke is 4 for 5 on the day, has 2 RBI's and is red hot with the bat today. Next up is Danny Casey who hits an RBI single up the middle. 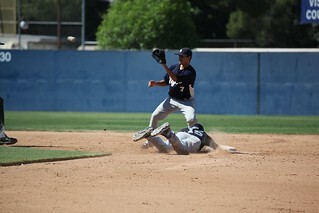 He later scores on a sac fly by Erick Melara. Chad Gordon follows with an RBI single. The Blue Jays get 4 big runs in the inning to take a commanding 9-2 lead through 7 1/2 innings of play. The Tigers' Angel Nunez led off the bottom of the 7th with a solo homer to left center field. Two batters later, Justin Kaid drives one deep and over the fence in left center field as well. The CBA Tigers get 2 runs in the inning to trail 9-4 through 7 complete. The Tigers manage to add another run in the 8th; courtesy of a Jaime Dorado RBI single. But that would do it, as the Blue Jays held on to beat the CBA Tigers by a final score of 9-5. They force the third and deciding game; which is sure to be a good one. The rubbermatch is next! Welcome back to College of the Canyons in Valencia for game 3 of the PCBL Major League Division Championship. The field has been prepped and we were ready for the second of our championship double-header at beautiful COC! Let the third and deciding game begin! The CBA Tigers are the visiting team in this championship rubber match. They come to bat in the top of the 3rd inning with the game scoreless. Johnny Alcaras leads off the inning with a single. The next batter is JC Barker and he is hit by a pitch. Next up is Jaime Durado. He reaches base on a throwing error by the pitcher; as a run scores on the play. Two batters later, Justin Kaid grounds into a 6-4-3 double play, but gets an RBI in the process. The Tigers settle for 2 runs in the inning to take the early 2-0 lead. The Tigers come to bat in the top of the 4th inning; still leading 2-0. Tony Cabrera draws a 1 out walk. He eventually scores on an RBI double by JC Barker. They get the lone run in the inning to extend their lead to 3; up 3-0 through 3 1/2 innings of play. The Blue Jays had been held to no runs and only 1 hit as they came to bat in the bottom of the 6th inning. Then things changed. 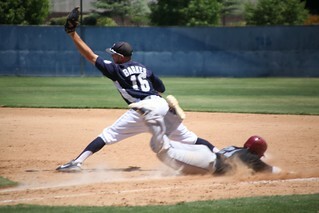 Dominick Hanna opened with an infield single off the shortstop; and he stole 2nd shortly thereafter. Corey Richards responds by lining one back at the pitcher for an infield hit of his own. The next 2 batters are retired. Garrett Behnke comes to bat with 2 out and 2 on. He slaps a single to right; scoring Hanna & Richards. 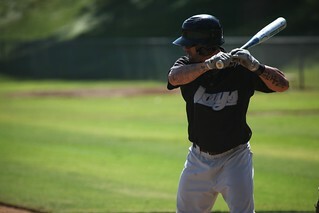 Next to bat is Danny Casey who singles up the middle to keep the inning alive for pitcher Eddie Baeza. His team is down 3-2 as he steps into the box with 2 out and 2 on. He blasts a 3-run shot over the fence in right center field. He helps his own cause in a big way; putting the Blue Jays up 5-3 as we have completed 6 innings of play in this championship. The Blue Jays still lead 5-3 as they come to bat in the bottom of the 7th inning. Erick Melara leads off with a single up the middle. Chad Gordon also singles; forcing the Tigers to pull starting pitcher Mike Soto and sending in David Lira. Two batters later, Kevin Serr singles home Melara. Chris Cervantes follows with an RBI single down the left field line and into the corner. He later scores from 3rd on a wild pitch. Two walks and an error later; Scott Strickland hits an infield RBI single. When all is said and done, the Blue Jays racked up 8 runs in the inning; slamming the door on this Championship series for good. 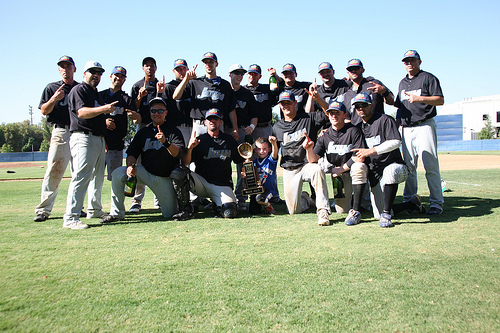 They win by the final score of 13-6; thus claiming the 2013 Major League Division Title. Congratulations to Brandon Loomis and the Blue Jays who rallied from the game 1 loss on Saturday to come her on Sunday and take 2 from a tough CBA Tiger squad. And a big tip of the cap to the Tigers for such a dominant season and for earning their way into this years' championship. We will definitely see them here again! Garrett Behnke - He struggled a bit early in game 1; but soon showed why he is regarded as one of the league's most solid hitters. He goes 5 for 6 in the pivetal game 2; hitting a double and four singles to lead the charge for the Blue Jays. Nice job, Garrett! 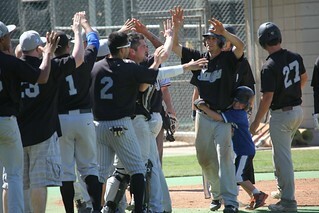 Series Stats: 7 for 14 (.500 Avg); 6 singles, double, 4 RBI's, 4 Runs, Sac. Eddie Baeza - This guy seems to come up big when it reallty matters. After a dismal game 1 at the plate; he turns things around with a 3-run homer in game 2; followed by a 3-run jack in game 3 ... the same game that he pitched a complete game! Way to bring it, Eddie!